Aim of the initiative: To support biodiversity in the Midlands of Tasmania through education. It involves partnerships with schools, the University of Tasmania and farmers. The program is linked to the Australian curriculum with a focus on STEM. Target audience: Teachers and students, and through them to the community. Organisation mission: To conserve and restore landscapes at scale through collaborative, science-based and innovative conservation programs. 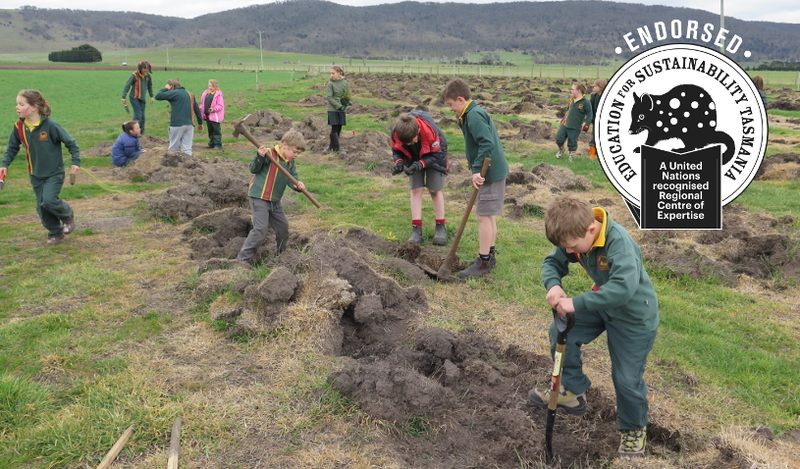 Students from both Midlands and urban schools have been actively engaged in planting and caging trees on Midlands farms, undertaking replica planting in their schools, germinating local eucalypts and researching direct seeding trials. Highlights of the program have included a Big Biodiversity Night out at Campbell Town for students and the community. In a pre-program survey it was found that not one student (of 180) could identify all four key species of threatened mammals in the Midlands but they could all identify four African mammals! Campbell Town teacher Lani Young has made Tasmanian mammals a focus for her science curriculum. Oatlands secondary teachers are working with Honours researcher Yolanda Hanusch investigating the effects of ants on the direct seeding trials on the school farm. The restoration has also been the focus of statewide forums and field days with 120 grade 11/12 Geography students. A partnership with Campbell Town High School students and Architecture and Design students from the University of Tasmania is focused on creating a sculpture trail in Ross to showcase the large scale restoration. Students developed ‘Species Hotels’ which will be installed on site on the riverside at Ross. Design and Technology students at the University of Tasmania are developing a gaming app to further highlight this work. An ongoing program of regional forums and a combined Midlands field trip supported by scientists and researchers has engaged Grade 11/12 geography students statewide. Bushrangers is an evolving program. Greening Australia and teachers are documenting their work in developing STEM curriculum units focussed on biodiversity. STEM education is the intentional interdisciplinary approach to learning where the curriculum is coupled with inquiry or project-based learning to address real world challenges. The real world challenge of restoring the Midlands biodiversity hot spot provides a perfect vehicle for engaging educational opportunities. What is your educational message? Tasmania is Australia’s last refuge for many threatened animals – species that are now virtually extinct on mainland Australia. Greening Australia through Tasmania Island Ark is working to reverse the decline of biodiversity in the Midlands and reconnect people and nature in a globally significant landscape recreating over 6,000 ha of new habitat to create a stronghold for Australia’s critically endangered animals while revitalising local Tasmanian farming communities. Bushrangers aims to engage students in taking practical action as agents of change and awareness in the wider community. Better understanding of biodiversity issues in the Midlands. Broad uptake of biodiversity curriculum engagement. The Bushrangers project is an evolving initiative which adapts and builds on the enthusiasm and skills of teachers and project partners to build a dynamic program responsive to curriculum initiatives and future sustainability directions. Greening Australia has planted 300,000 trees in the last three years in the Midlands Biodiversity Hot Spot. We have engaged five schools, Grade 11/12 Geography teachers, University of Tasmania researches and farmers who work together to support the biodiversity program.